Zinc has an important role in the metabolic activities of the body. Deficiency of zinc is also called Hypozincemia. Deficiency of zinc may lead to various health problems like abnormal growth, genetic disorders, fertility problems and so on. 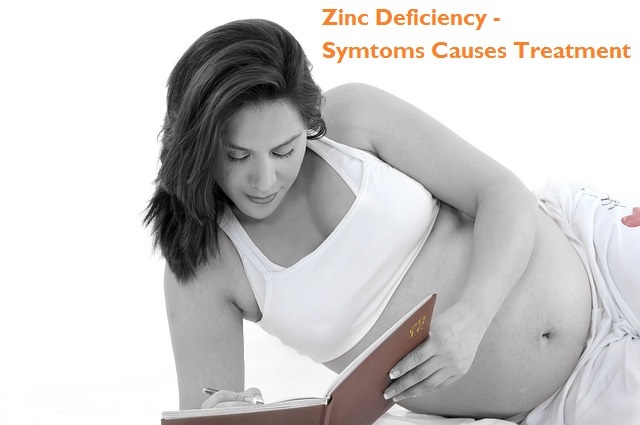 Deficiency of zinc effects mostly pregnant women, breast feeding mothers and young children. Brittle nails –The nails become brittle and break of easily. Decreased appetite – Zinc deficiency causes loss of appetite, which if not treated, may lead to anorexia. Diarrhea – This is caused due to poor immune system. The bacteria causing this disease easily attack the body. Infections of the eye – Being prone to infections, the eyes also get infected easily. Loss of hair – Hair loss and skin lesions is one of the prominent symptoms of zinc deficiency. It is caused due to weak cells formed as a result of zinc deficiency. Loss of sense of smell, taste etc. – Many people suffering from zinc deficiency fail to distinguish various smells and tastes. Blemishes on the skin – Blemishes on the skin are also a sign of zinc deficiency. Insomnia – If you suffer from insomnia, zinc deficiency may be the reason. Poor immunity power – This makes the body week and prone to infections, cold, flu etc. Stunted growth – Proper growth of the body is also affected by zinc deficiency. If you have acne and pimples in your face, including food rich in zinc will help you to get rid of them and have a blemish free skin. Using zinc based creams is an excellent and effective method to treat acne vulgaris. Zinc is essential for growth and cell division. During pregnancy, zinc intake must be enough to ensure proper growth and development of the fetus. Zinc is vital for proper growth of children, and to ensure that their height, bone development and body weight remains normal. The retina of your eyes contains fair amounts of zinc and its deficiency may lead to partial blindness or complete loss of vision. Zinc is also essential for preventing nigh blindness and cataract. So, include enough zinc in your daily diet to keep your eyes healthy and to have a good vision. Deficiency of zinc may cause PMS or menstrual cycle imbalance. So always take care to include enough zinc in your daily diet to tackle such issues. Pregnant women suffer from depression if they lack zinc. Zinc is very effective in healing all types of wounds. It is good for treating gastric ulcers too. So if you are suffering from this disease, take zinc supplements and you will get relief from it. It is especially effective in the early stages. Sebum is necessary for healthy and moisturized hair and zinc is essential for its manufacture. Sebum keeps the scalp conditioned and it also removes dandruff from the hair. If your body lacks zinc, you will suffer from hair loss and baldness. It also results in thin and dull hair and causes graying of the hair. Most of the dandruff shampoos that you get in the market contain zinc. This is a condition when the ovaries and testes fail to produce eggs, hormones and sperms. Normal functioning of the cells is affected by zinc deficiency. As a result, the antibodies in the body are weakened. One suffering from zinc deficiency may not get a sound sleep. He will suffer from sleep disturbance and also from behavioral problems. As a result the patient may look tired and irritated. The person will also suffer from lack of concentration. This can be corrected by taking foods rich in zinc. Zinc deficiency may cause problems during child birth like difficulty in delivery, long periods of labor pain, hemorrhage, depression and so on. Your skin and nail are greatly affected if you lack zinc. You will suffer from skin lesions, hangnails, inflamed cuticles, white spots on nails, dry skin, skin rashes and so on. The nail becomes brittle and its growth is also affected. Some of the serious skin problems like psoriasis, eczema, dry skin and acne are also caused by zinc deficiency. Zinc renews and rejuvenates the cells of the skin. Diaper rash, wounds and cuts may be healed by applying creams containing zinc. The anti inflammatory properties of zinc are also made use of in many health treatments. It is excellent for preventing gum diseases, sun burns, psoriasis and blisters. Dysfunction of thyroid glands causes hormone disorders and lead to various health problems. Now research has shown that zinc is very beneficial for those suffering from abnormal secretion of thyroid hormones. The thyroid secretes two types of hormones, T3 and T4. Both these hormones are essential for the normal functioning of the body. Zinc is very essential for the normal functioning of these hormones. If the body is deficient in zinc, the thyroid gland cannot change the inactive hormone T4 in to T3, which is the active hormone. As a result, the thyroid gland becomes underactive. Try to consume uncooked food rich in zinc as zinc may be lost when the food is cooked. Do take overdose of zinc.